Description: In 2001, researchers on Team Echinacea planted an experimental plot to assess how parental relatedness affects progeny traits, especially fitness. Seedlings were generated from one of three cross types: between maternal half siblings; between plants from the the same remnant, but not sharing a maternal parent; and between individuals from different remnants. Seedlings were germinated and grown in a greenhouse until the plugs were planted in Experimental plot 1. Seedlings were randomly assigned locations within the experimental plot and planted in spring 2001. Every summer, team members assess survival, growth, and reproductive fitness. We harvest heads in the fall and during the winter we count fruits and assess seed set. 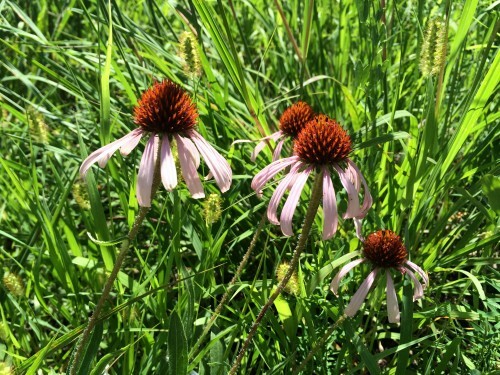 Read updates about this experiment on our flog (field blog) as written by members of Team Echinacea.